First of all, we’re sorry that you had to wait in line. But now, we’re ready for you! We hope you are ready to start saving data, too. This is what’s gonna happen: We’ll let all of you in, gradually – starting right now. You still have to wait in line for a little bit, depending on your position in the queue, but you’ll start to see the number ahead of you decrease. Don’t worry. You don’t need to watch the line to see when you are in it. We’ll notify you directly on your phone when it’s your time to try out Opera Max. So sit back, relax. You’ll be surfing the web and save data in no time. So how does Opera Max work again? If you don’t know what Opera Max is all about, it’s our new, free data-savings app for your phone that helps you get the most out of your limited data plan. Opera Max compresses videos, photos and text across most of your phone’s apps giving you a lot more mobile data for free. It also gives you better control over how your phone’s apps consume data. The real kicker is that we save you heaps of data on those heavy videos you watch. So now, by using Opera Max, all the fun videos from Vine, YouTube or any of these other apps will load faster, more efficiently, and eat up less of your data plan. In other words: No more of that annoying buffering stuff. We’ve made a video to show you how Opera Max works and what it can do for you. No other piece of technology can do this for you today. And, if you also get an Opera browser for your phone, you’ll have the ultimate savings kit. We’d love to hear what you have to say, especially since Opera Max is still in beta. You can give it to us here. 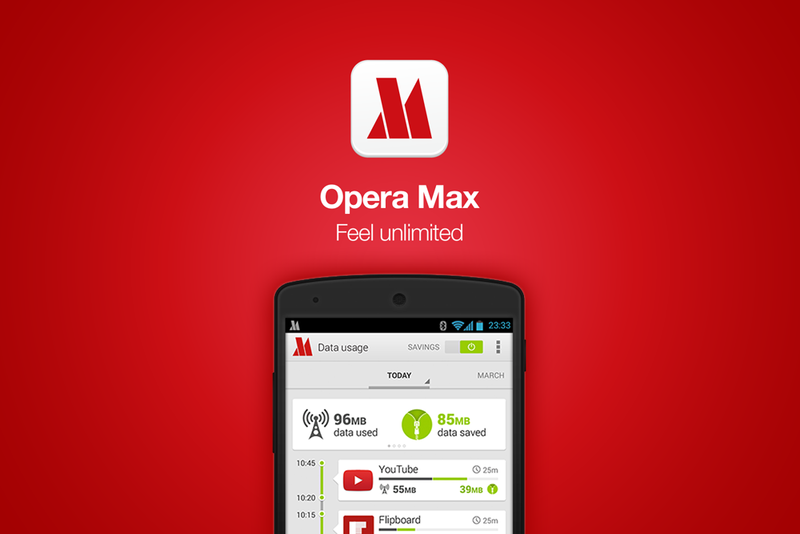 Download Opera Max right now from the Google Play Store. Happy savings! Opera Max beta crunches together a ton of mobile data on your phone, so you get more out of your plan and view content like video, images and text much faster. We hope. That’s why we’re doing a beta.